Dental implants are metal anchors surgically positioned in the jaw bone underneath the gums to support an artificial crown where natural teeth are missing. Implants are in no way cemented or connected to remaining teeth like traditional crowns or bridges. However, the crown that is created for the implants is laboratory-fabricated similar to natural tooth supported crowns. How do they work? 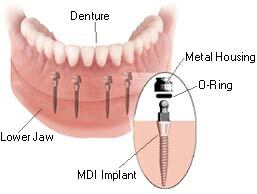 When the implant is anchored into the jaw bone the bone actually attaches itself to the implant. The advantages to this include increased stability of dentures while also reducing long-term bone resorption, and the ability to restore a missing tooth without altering the teeth on either side of the space. A miniature titanium implant acts like the root of your tooth while a retaining fixture that is incorporated into the base of your denture keeps your denture solid with no movement. The head of the implant is shaped like a ball and the retaining fixture acts like a socket that contains a rubber O-ring. The O-ring snaps over the ball when the denture is seated and holds the denture in place. When seated, the denture gently rests on the gum tissue. 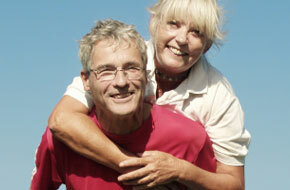 The implant fixtures allow for micro-mobility wile withstanding natural lifting forces.